The fastest roller coaster in U.S. If you love thrill rides and consider yourself an amusement park aficionado, then taking a spin on any of the top 10 roller coasters in the United States is probably on your to-do list. There are countless styles of steel and wooden roller coasters and each has its own fascination and speed; but what makes it "the best?" Is the tallest and fastest coaster the best? Are longer length rides always better than shorter ones? Are steel coasters better than wooden? If a roller coaster is truly great, people will talk about it and line up to ride it -- again and again. They will post about the rides online at sites such as YouTube and Ultimate Roller Coaster. These top coasters will make you scream, turn your knuckles white and make your heart pound. These coasters are the best of their kind because they leave you breathless, and at the same time, wanting more. Time magazine's poll of top coasters revealed that Kingda Ka at Six Flags Great Adventure in Jackson, New Jersey is a top 10 roller coaster. It opened at the theme park in 2005 and is a single hill coaster that reaches a height of 456 feet. It has an incline of 418 feet and reaches a speed of 126 miles per hour in less than four seconds. It is the tallest and fastest coaster of its kind, similar to Cedar Point's Top Thrill Dragster. Coaster Fanatics called the El Toro roller coaster "the" best roller coaster of its kind. Housed at Six Flags Great Adventure in Jackson, New Jersey, this wooden coaster differs from traditional coasters because it was prefabricated as opposed to having all its tracks individually placed. El Toro was built in 2006 and has the second steepest drop of any wooden roller coaster worldwide at 76 degrees. It stands 188 feet, reaches a maximum speed of 70 miles per hour and gives riders a feeling of weightlessness with nine different air born opportunities. Cedar Point in Sandusky, Ohio is home to Raptor, the steel coaster My Roller Coaster deems as the ultimate ride. Built in 1994, Raptor is an inverted coaster that goes up to 57 miles per hour. The ride is a little over two minutes long and drops you 119 feet at its highest hill. It contains corkscrews, loops and a cobra roll. Since it's an inverted coaster, it gives riders a feeling of being on a very fast ski lift. Coaster Grotto rates Bizzaro, formerly known as Superman - Ride of Steel, as a top roller coaster. Constructed at Six Flags New England, this steel roller coaster features two underground tunnels and reaches a top speed of 77 miles per hour. This 5,400-foot long ride has a maximum drop of 211 feet and stands 208 feet tall. The coaster drop is longer than the ride's height because it drops into one of the underground tunnels. The Los Angeles Times rates Hersheypark's Lightning Racer as the best wooden roller coaster in the United States. 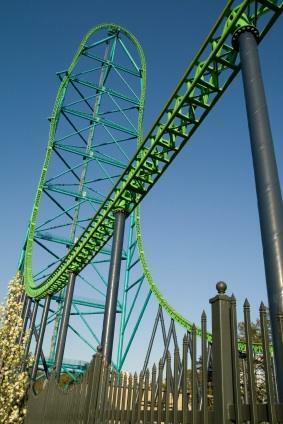 Built in 2000 in Hershey, Pennsylvania, this coaster boasts dual 3,400-foot tracks, each having a 90-foot drop. The racing coasters top out at 55 miles per hour. Cedar Point's Maverick was rated the best roller coaster "mega-engineered to make you scream" by Popular Mechanics. Maverick is considered the best because it is the only coaster in the world to have a twisted horseshoe roll, one of 10 banked turns on the steel coaster. The ride opened in 2007 and is 105 feet high and reaches a top speed of 70 miles per hour. Named a Golden Ticket Award winner in 2009, The Voyage at Holiday World and Splashin' Safari in Santa Claus, Indiana features 24.2 seconds of airtime, five underground tunnels, multiple track crossovers and a series of dramatic drops. The hybrid wooden coaster is 6,442 feet long, stands 163 feet tall and reaches a speed of 67.4 miles per hour. At 93 miles per hour, Cedar Point's Millennium Force stands 310 feet tall. When it was built at the Sandusky, Ohio theme park in 2000, it was the tallest and fastest steel roller coaster in North America. It was rated one of the best roller coasters in the United States by America's Best and Top 10. Woman's Day magazine ranked The Beast, located at Kings Island in Kings Island, Ohio, as a top thrilling roller coaster. It is regarded as the world's longest wooden roller coaster, covering 35 acres and spanning 7,400 feet. The ride is almost five minutes long and reaches a top speed of 70 miles per hour. Ohio's Kings Island is home to the Diamondback roller coaster. Theme Park Insider considered this steel coaster as the best new theme park attraction in 2009. It stands 230 feet tall, is 5,282 feet long and tops out at 80 miles per hour. Diamondback has 10 drops with the deepest being 215 feet. This ranking of the top 10 roller coasters is not an all-inclusive list. There are many more premium steel and wooden coasters out there that are just as thrilling as the ones listed. If there's a roller coaster that you feel is top notch, leave a note about it in the comments section below.